I got up fairly early to get the bus from the centre of Corinth to the Isthmus bus station, only to find out that the buses to Olympia were full up and the next available seat was 12, a wait of 2.5 hours. The bus station is only a 5 minute walk to the Corinth Canal, an absolutely amazing feat of engineering and entertaining to watch the tourist ships sail past. From Corinth Isthmus bus station, it's a 6 hour bus ride to Olympia. Not a direct bus, as it actually stops in Pyrgos. From there's it's a 30 minute ride on a local bus to the village of Olympia. Something which I only realised when fellow passengers enquired about my destination. Again, something the bus staff negelected to tell me. I can't wait for the time when the Greek government are compelled by the Troika to reform it's public services! With my stomach satisfied, there's not much else I wanted to do. Coincidentally, I got to watch the 2012 Olympic Opening Ceremony in the evening. The next morning, I'm up early to hopefully avoid the expect hordes of tourists. The place was virtually empty, save for a few fellow tourists. Along with the entrance ticket, there's also a good pamphet explaining everything about the points of interest in the site. It's about lunch time when I'm finally done in the museum where I get a badly needed cappuccino before heading back into modern Olmpia for some exploration. It doesn't take very long to wander about modern Olympia. There's really only one street and it's full of tourist shops. Sadly, the empty streets of the previous night aren't much different from the empty streets of the day. The shop assistants all tell the same sad story. Olympia should be packed with tourists this time of the year. Another victum of the economy or misconceptions about Greece. Overall, a very low key visit. In retrospect, there was no real need to stay a second night. 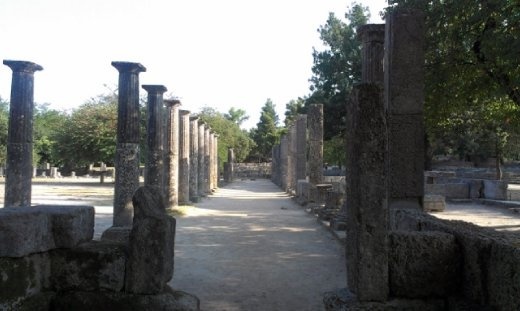 Olympia is just a little village and there's precious little else to do beyond the archaeological site.